There are still ranches in today’s modern San Ramon Valley, with the traditional challenges of drought added to new ones related to suburban development. Cattle graze in the Tassajara Valley, in Crow Canyon and on East Bay Regional Park lands. Often successful ranchers own properties in other parts of California or Oregon, giving them the flexibility to strategically move their stock. In the early years, cattle were driven directly to slaughter houses from local ranches. Cowboy Eddie Canton, who later worked for Hap Magee, said that "I would drive cattle from Mount Diablo down Danville Boulevard, then through Crow Canyon to Hayward and into what’s now called Union City, to a slaughterhouse there. It would take three days." Gordon Rasmussen recalled drives down Crow Canyon as well. 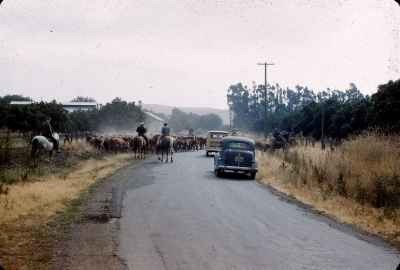 Herds ready for sale were driven from ranches on Tassajara Road to the Wood Ranch’s cattle scale. Roger Podva, a prominent resident of Danville, was one of several "country buyers" (agents for slaughter houses or feed lots) who bought cattle over this scale." 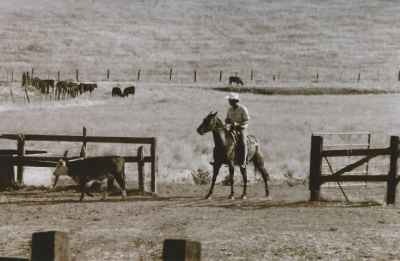 The last use of the corrals on Danville railroad station land was by Blackhawk Ranch in the early 1940s when Lorens Foard received stocker cattle by train from Idaho and drove them on the streets through Danville to the ranch via Diablo Road. Annual round-ups and brandings were an essential part of raising cattle. Ranchers vaccinated, branded all calves, and castrated most males. People came from all over to watch the brandings, do some roping and enjoy themselves. All this work was followed by a potluck and barbeque. 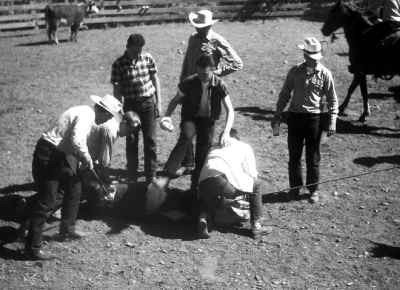 The Wiedemann round-ups were famous in the valley, with Fred Wiedemann beginning the tradition in the early twentieth century. These gatherings were a welcome break in what seemed to be unremitting work for ranch families. The ranching lifestyle may be seen as a romantic one, with cattle dotting the flowing landscape and horseback rides into the hills. But hard work and uncertainty come with the life. Cattlemen and their cowboys tended the cattle, decided when to buy and sell the stock, built and took care of fences, fended off intruders (both people and animals), all while relying on decent rainfall to make a profit. California’s periodic droughts were a nightmare for ranches and farmers. The Tri-Valley, with its weather and cattle forage, is premier cattle country, according to Sunol rancher Tim Koopman and others. Pat Flanigan said that the burr clover at The Blackhawk made that ranch the best in the west for raising cattle. Grasslands in the East Bay provide "a tremendously productive ecosystem, in terms of producing great volumes of both forage and seed," according to David Amme. In the Tassajara Valley the average stocking rate is 1 AUM (cow + calf) per 6 acres per year; by comparison, in Tonopah NV the stocking rate is 1 cow per 118 acres per year. When interstate freeway I-680 opened in the mid-1960s and property owners were taxed on the "best use" of the land, the ranching era drew to an end. In one newspaper interview, Jeff Wiedemann said "The only reason there are houses in the San Ramon Valley is that ranchers got squeezed out." New residents arrived with different attitudes toward farms and ranches. Orchard crop dusting came to an end. Tractors were vandalized when left out, people cut fences letting cattle loose, teen-agers drove over the land doing wheelies, and dogs chased the livestock. The new folks said they valued the open space and clean air but many of them didn’t acknowledge that these agricultural lands were private property. The ranching support system also declined. With development, stores which sold parts, chemicals, and basic ranching supplies moved east to the Central Valley. Traffic came with suburban development and modern roads were no longer available for cattle drives; today cattle are loaded on trucks for transport. Ranchers coped by selling land for development near the freeway, putting conservation easements over their property with the California Rangeland Trust (or other entities) and running cattle on East Bay Regional Park District lands. The Park District leases land for cattle grazing on over 70,000 acres. With few exceptions, East Bay ranchers today make their living away from their ranch and don’t depend on ranching for their main income. The severe drought of the mid-seventies was a final straw for the Wiedemanns as grass and water for the cattle dried up. Accepting the inevitability of development, they sold land for housing on the San Ramon Valley’s eastern and western hills and on much of their original ranch off Norris Canyon Road. The Elworthys, Rasmussens and Wiedemanns do continue to ranch. And these families seem to be reconciled to the changes. is HiAnn Wiedemann Kaplan said in one 1990 interview: "It is too bad that it is all being developed, but what can you do? It is a beautiful area with wonderful climate and you can’t fault people for wanting to live here." In 1900, the San Ramon Valley included 2727 people with small villages, farms and ranches covering the landscape. By year 2000 the area had been reshaped into housing developments, retail centers, Bishop Ranch Business Park and two incorporated cities. The 2010 valley population was 141,646. While grazing exists in the Regional Parks and on some valley properties, most working ranches have moved east as development occurred. The impacts of post World War II growth and the vagaries of weather have transformed cattle ranching in the entire East Bay. But the memories remain. Ranchers like Gordon Rasmussen affirm "This business gets in your blood. Even in tough times, when you could make other moves, you still get a kick out of it." Valley families recall the joys of ranch life, the hard work, the waving green spring grasses, annual round-ups and barbeques, and the neighborliness of a past era. Amme, David, Grassland Heritage, "Stewardship of a Changed Landscape," in Bay Nature, April-June 2004. California Historical Society magazines, Contested Eden: California Before the Gold Rush (1997) and A Golden State: Mining and Economic Development in Gold Rush California (1998/99). Cleland, Robert Glass, A History of California, The American Period, NY: The Macmillan Co., 1939. Contra Costa Times, Rasmussen quote, 10-17-1991. Interviews and newspaper articles: Denise DeFreese, Gordon Rasmussen, Jeff Wiedemann, Don Wood, Pat Flanigan, Ann Kaplan. Rutherford, Richard, "The $$$ Trend, Red and Black, A History of Agriculture in the San Ramon Valley," The Valley Pioneer Centennial Edition, 9-4-1958. Hoof and mouth disease. San Ramon Valley Herald, 1984 -- Eddie Canton. San Ramon Valley Herald, "San Ramon Ranchers Look Back." 5-8-1990 -- Ann Kaplan. San Ramon Valley Times, 6-16-1985, Jeff Wiedemann quotation. ---------, Dougherty Valley album, 2008. museum archives.